Loneliness is marked by a sense of isolation. Solitude, on the other hand, is a state of being alone without being lonely and can lead to self-awareness. Solitude is a state of seclusion or isolation, i.e., lack of contact with people. It may stem from bad relationships, deliberate choice, infectious disease, mental disorders, neurological disorders or circumstances of employment or situation. Short-term solitude is often valued as a time when one may work, think or rest without being disturbed. It may be desired for the sake of privacy. A distinction has been made between solitude and loneliness. In this sense solitude is positive. There are many benefits to spending time alone, freedom is considered to be one of the benefits of solitude. The constraints of others will not have any effect on a person who is spending time in solitude, therefore giving the person more of a scope to his actions. With increased freedom, a person’s choices are less likely to be affected by exchanges with others. A person’s creativity can be sparked when given freedom. Solitude can increase freedom and moreover, freedom from distractions has the potential to spark creativity. In 1994, psychologist Mihaly Csikszentmihalyi found that adolescents who cannot bear to be alone often fall short of enhancing creative talents. Another proven benefit to time given in solitude is the development of self. When a person spends time in solitude from others, he may experience changes to his self-concept. This can also help a person to form or discover his identity without any outside distractions. 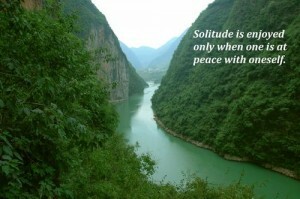 Solitude also provides time for contemplation, growth in personal spirituality, and self-examination. In these situations, loneliness can be avoided as long as the person in solitude knows that they have meaningful relations with others. Solitude does not necessarily entail feelings of loneliness. For example, in religious contexts, some saints preferred silence and found immense pleasure in their uniformity with God. Buddha attained enlightenment through uses of meditation, deprived of sensory input, bodily necessities, and external desires, including social interaction. The context of solitude is attainment of pleasure from within, rather than seeking it in the external world. In psychology, introverted individuals may require spending time away from people to recharge. Those who are simply socially apathetic might find it a pleasurable environment in which to occupy oneself with solitary tasks. Being alone can be painful. It can also be blissful. 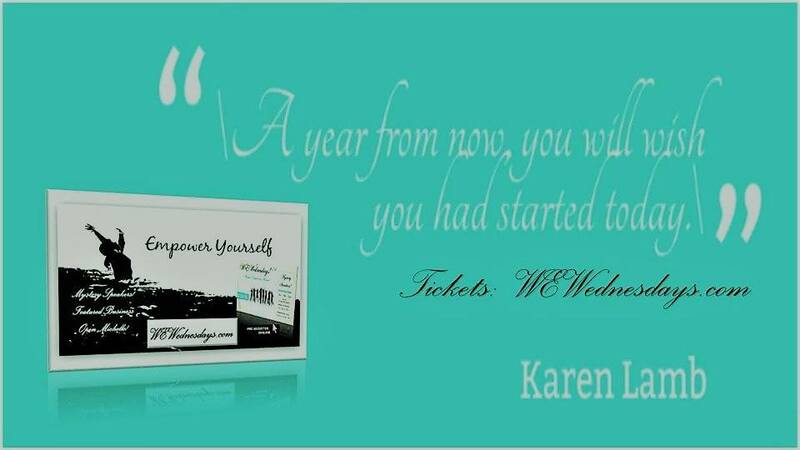 It all depends on your level of personal development in this area. A joyful state when you’re alone is attainable. And it is a very worthwhile pursuit. Once you learn how to be alone you will no long be chained to the desperate need to keep a person in your life even though the relationship is bad for you. Whether the person is a lover, a marriage partner, a friend, or even a family member what good is it if the relationship brings you pain and lower self-esteem? 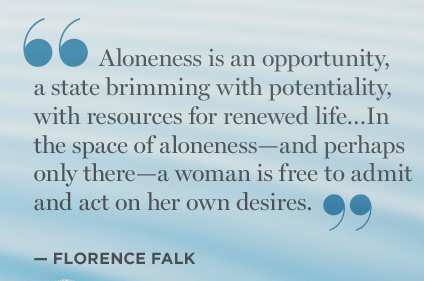 If you can’t bare the thought of being alone you will always be in a position of weakness in your relationships. However, once you learn how to be alone and truly enjoy it you’ll be able to negotiate your relationships from a position of strength knowing that you can end it and be okay. We all experience moments of intense loneliness. We initially experience this when we are left alone for the first time as children. As we develop and grow we learn not to fear being alone. Nevertheless, there times when we face feelings of loneliness. These times can be extremely difficult at first. Transitions in adulthood can bring on powerful feelings of loneliness. When we break up, get a divorce, or a partner dies we are suddenly alone. Before this event, we grew to rely on their companionship. We knew that during almost every evening, weekend, and holiday we would have someone to share it with. The sad feelings that you experience can be the same when a close friendship ends. If your break up or divorce was preceded by months of tension, the separation might come as a relief initially. After a few nights and weekends alone, however, the relief can turn into desperation about being alone. It is at this point where profound growth is possible. You can use the pain of the break up and the loneliness to move yourself past the sometimes terrifying feelings of facing the future alone! Once you breakthrough and find your strength, which is present in you right now, you’ll experience a whole new world of personal power and freedom. You can break free by learning how to be alone and truly enjoy it. There is something indescribably sweet about surrendering to your loneliness. 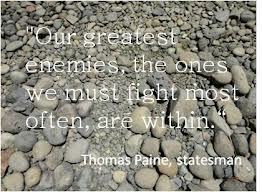 On the darkest of nights, when you come face to face with yourself, true self-discovery can occur. The quietness and the realization that you are completely alone in a world full of billions of people can be chilling. 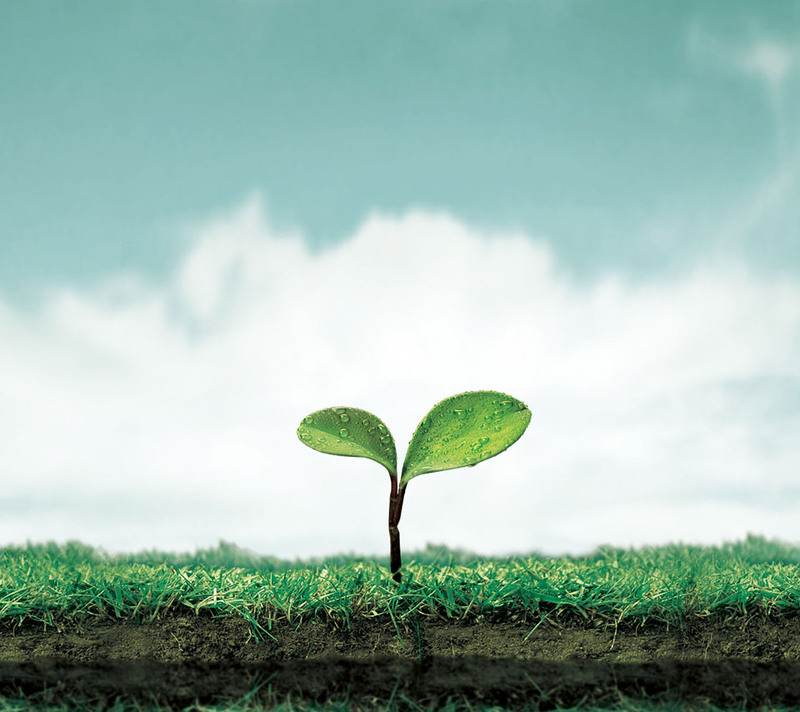 But once you embrace it and surrender to your aloneness you will begin to grow right there and then. And your growth can be rapid and profound. With each new experience of being alone you will grow stronger. Eventually you will begin to enjoy your own company without a nagging need to be with another person. Once you reach this point, you’ll have the power to choose whether or not you want to spend a Saturday night alone, with a friend, or with a love interest. Your ability to choose any of these options without any worries empowers you. Then if you do chose to enter into a relationship, you’ll be able to do it from a position of strength, independence, and confidence. 2. How Do You Learn How to Be Alone? Don’t fight being alone by trying to distract yourself. Don’t distract yourself by scheduling all your free time with friends. Don’t distract yourself with over indulgence of food, alcohol, drugs, television, the Internet, or video games. Just be with your loneliness until you come to terms with it. Face it head on! Deal with the feelings that come up. Stay with the discomfort until you find your way to contentment. If you are frightened, move toward your fears until they dissipate. As it is with most fears, you’ll most likely find that what you feared was only an illusion or a misunderstanding. Embrace being alone by using these periods to get to know yourself on a deeper level. Perhaps on a deeper level than you have in your entire life. You can’t do this by spending a few hours alone. You need much more time. Several weekends or even an entire week’s vacation would provide a great start toward mastery of being alone. Once you can spend a Saturday night, a weekend, or an entire vacation alone and truly enjoy it you’ve mastered yourself. You teach yourself how to enjoy your own company by treating yourself like you would a close friend or lover. 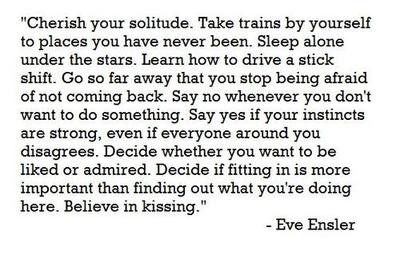 You look for ways to enjoy, entertain, and please yourself. And yes, I mean the big “M.” There are benefits to learning this art as well, especially for women. Men don’t need any coaxing in this area. Whenever I refer to the benefits of learning to be alone, I am not only talking about you but also the benefits that your lovers and friends will enjoy. These relationships will benefit because you will be able to participate in them from a position of strength and giving rather than weakness and neediness. 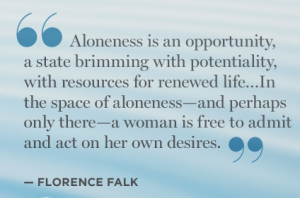 If you can’t bare even the thought of being alone you’ll put unhealthy demands on these relationships. You will also sell yourself short because of your inability to enter and maintain these relationships from a position of strength and confidence. Use periods of being alone to get to know yourself. What do YOU like do on a Saturday night? Make yourself a gourmet dinner at home. Have fun! Enjoy your own company. If you don’t know what you find humorous when no one else is present, find out! If you don’t know what you enjoy to do by yourself, discover it! Make it an adventure! Make it an adventure of self-discovery! Your goal is to find peace, contentment, and confidence when you are alone whether you are at home, in crowded public space, or at table in a fine restaurant filled with couples on a Saturday night! Once you are comfortable, content, and happy in each of these situations you have mastered the art of being alone. Once this is achieved and you are able to “chose” whether you want to be in a relationship or with other people, your ability to truly love and give without fear or measure will be greatly enhanced. In his insightful book “Intimate Connections – The Clinically Proven Method for Making Close Friends and Finding a Loving Partner”, Dr. David Burns talks about the importance of learning how to enjoy being alone. He says that a person ability to have healthy relationship is in direct proportion to their ability to be alone. If a person is comfortable being alone, they are in a position of power and not neediness in a relationship. People who do not have the ability to be alone will be imprisoned if they find themselves in a toxic relationship.